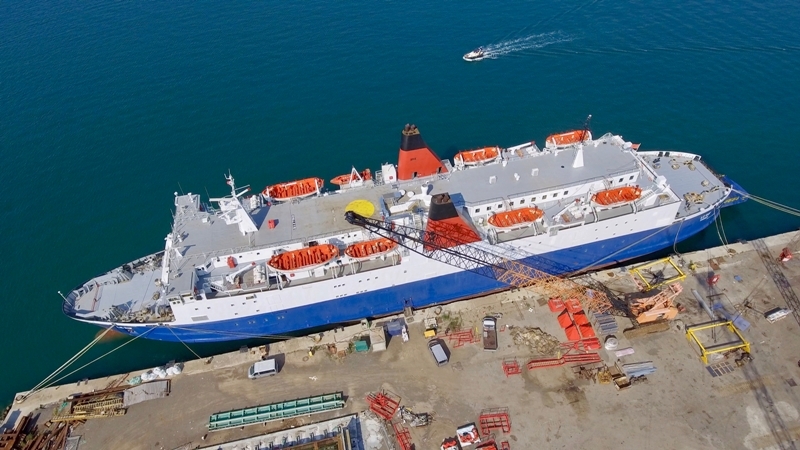 The veteran ferry LE RIF bought in 2017 by a newly formed Moroccan company called Detroit World Logistics Maritime (DWLM) and set to be deployed on a new route linking Algeciras with Tanger Med (which never started) is up for sale. The ship repair company Jobson Italy recently completed a big refurbishment work in dry dock before in the port of Naples, and then in La Spezia, but the owner never paid the bill so the vessel is now at auction. Alessandro Bardi, CEO and technical director of Jobson Italy, confirmed to FSN that “the ferry has been towed to the port of Genoa where is now ready to be sold or bare boat chartered out. Several negotiations are currently ongoing, but no deals have been signed yet”. The price is roughly EUR 10.7 million according to some broker sources. “That’s because the ship, after the refurbishment, came out rejuvenated, and her age is 10 year today,” Bardi stated.